Now for the next rebuild, I decided to use low power battery valves, to drastically reduce the heat involved, not just overall heat but also to lower the power dissipation in the tubes themselves, and therefore hopefully reduce that warm-up drift from the valves in the initial 30 minutes. The DF96 is a very nice 7-pin miniature valve, with a 1.4V 25mA DC filament. The filament power consumption of such a valve is just 35mW, compared to nearly 2 watts in a conventional 6.3V 300mA filament tube. 54 times less filament power. The anode dissipation will be less too. The battery valves were intended to use a DC battery for the filament, and the filament is also the cathode - this leads to more complicated design. Plus, if you abuse the tubes by running AC on them instead of DC, you have to deal with 50Hz hum superimposed on everything too. The initial rough build of the 6MHz VFO resulted in the black line shown in the chart below. Considerably less initial drift than the earlier versions. Encouraging! 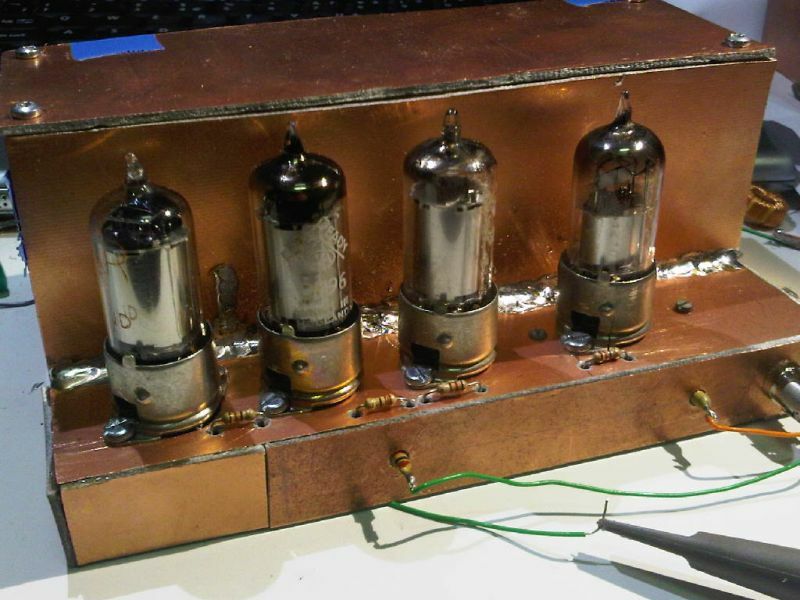 These photos show the circuit diagram and the back of the 4-tube oscillator chassis, which is soldered to the back of the same insulated polystyrene box with the VFO tank components. Notice in the circuit diagram, the use of the bifilar RFC's wound with 15 turns on FT3-43 toroids, in the heater filament wires. Drift charts are shown below: the black line is the battery valve oscillator version at 26MHz, and the red line is the DF96 VFO on its own at 6MHz with the other tubes unplugged. The drift of the DF96 on its own is very little, but there is now some annoying upwards drift gradually, long term. As expected though, the initial fast down drift from valve heating itself, is much less pronounced than in the higher power tubes and is faster. So battery valves seem to be a good improvement, worth continuing experiments with them. I'm not really totally content with the output of the battery valve oscillator circuit. It isn't as clean as the normal-power tubes, there is a significant amount of 50Hz hum superimposed on the 26MHz signal. The photo below shows the 6MHz signal, with the bluring of the trace quite clear - the photo on the right has the 'scope timebase switched to a slow setting so the 50Hz-related ripple can be clearly seen. I believe this is due to the fact that I am using directly heated filament tubes designed for battery operation (DC) on 1.4V r.m.s AC derived from the 6.3V transformer secondary winding. Furthermore the DAF91 was found to be prone to self-oscillation at 58MHz - it seems this tube is designed for the audio pre-amplifier section of the receiver immediately following the detector, it is not so good as an RF buffer. But what of the drift that still exists? Now I decided to investigate what happens with the power supply. Those power supply tubes (rectifier and voltage stabiliser valve) also get very hot, and perhaps their characteristics change too, with temperature, who knows. Also, gas tube regulators (and indeed, even solid state regulators), are not perfect - the VR150/30 is specified for a regulation current of 5-40mA but over that range, the voltage would change by 4V. Put another way, as the mains voltage varies slightly, so will the 150V output voltage, and this may be expected to have some effect on the oscillator output frequency too. I wanted to check if there would be an improvement in oscillator drift performance if I regulate the regulated voltage a second time. For this I need lower voltage regulators. The junk box contained a VR105, 0B2, and three CV449's. The VR105 and 0B2 are 105V regulators, the CV449 is an 85V regulator using neon gas. These tubes shown lit below: from let to right: 0B2, CV449, VR105 and VR150/30. The VR150/30 photo is part of my power supply unit. The voltage on the VR105 was found to be about 127V, rather than the specified 105V. The 0B2 measured near to 105V and the CV449 near to 85V. Of these tubes, the octal-base VR105 is the nicest glass shape (the same as the VR150/30); the CV449 has the brightest and most attractive glow. (click the thumbnails below for full size). (this circuit diagram shows the VR105. I mean, the 0B2, but the circuit would be the same regardless). If the 0B2 could take as much as 210V to strike, in the dark, then possibly it would never fire because of the 150V limit of the circuit driving it. However, my theory was simple: the 150V regulator will also be in the dark. The PSU HT is 260V. The VR150/30 will also not strike until many volts over 150! During that few seconds as the 260V line rises up as the rectifier filament heats up, the 0B2 will get plenty more than 150V, and will be able to strike. In practice, this exactly what was observed. 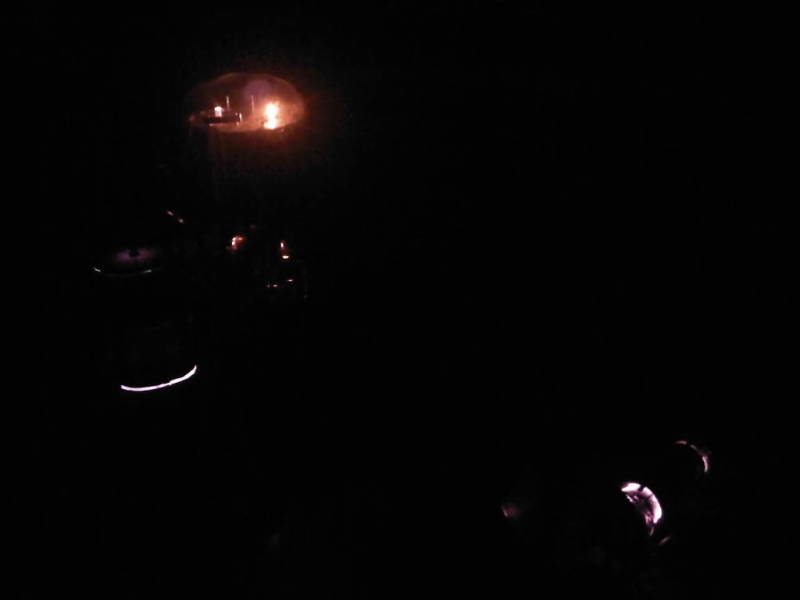 On switching on the PSU, the rectifier filament heats up. After some seconds delay, first the 0B2 lights up, followed about 1 second later by the VR150/30. 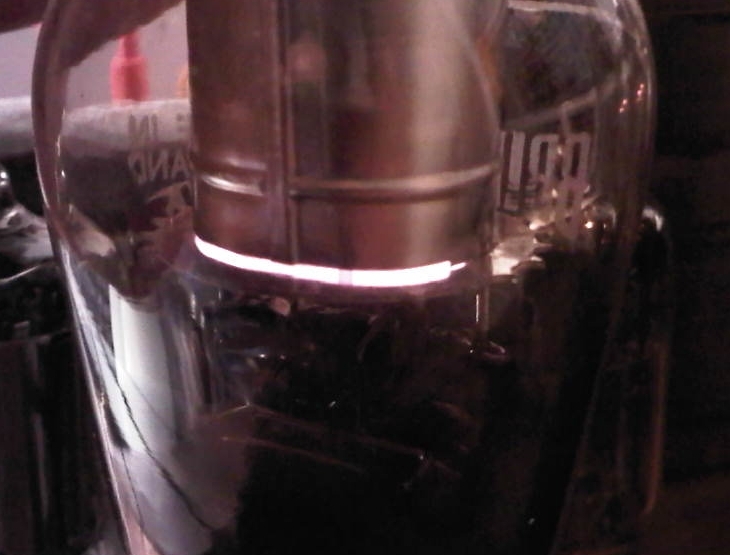 In this photo, the bright orange at the top is the filament of the rectifier valve. 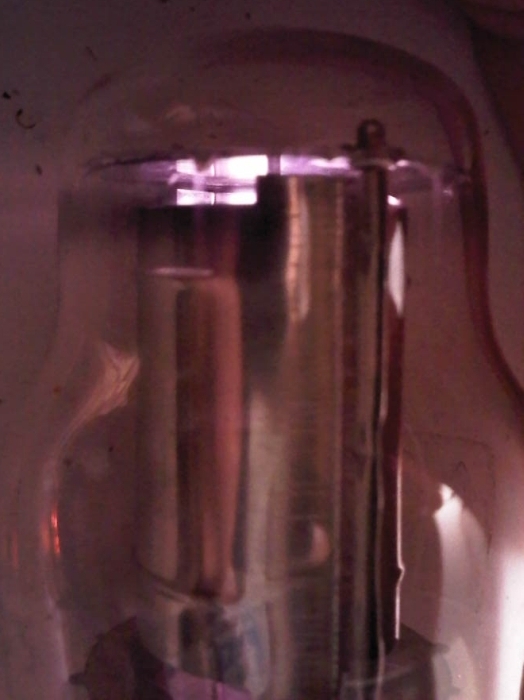 The purple "smile" at the bottom left is the purple glow from the ionised gas inside the VR150/30. The purple glow at the bottom right is the 0B2. Back to drift... the chart below shows the drift performance with an 0B2 and with the CV449. The 0B2 at 105V results in spectacular stability, the drfit from cold was down to -72Hz, and back up over +100Hz but in the final hour of operation, it stayed within a narrow 50Hz band. The CV449 was less good, but there may also have been other factors - for that test I had to lower the anode resistor in the DF96 oscillator circuit because otherwise the output signal was insufficient to drive my frequency counter. The higher power than in the 0B2 test might have changed the result. This chart below just shows the same thing, but with the vertical frequency axis expanded to cover -400 to +200Hz. To test the question of how (if at all) the operating current of the DF96 oscillator tube affects the frequency stability, even with lower output power than my frequency counter can reliably measure, I built an EF91 buffer to boost the output (the EF91 has a normal 6.3V 300mA filament). 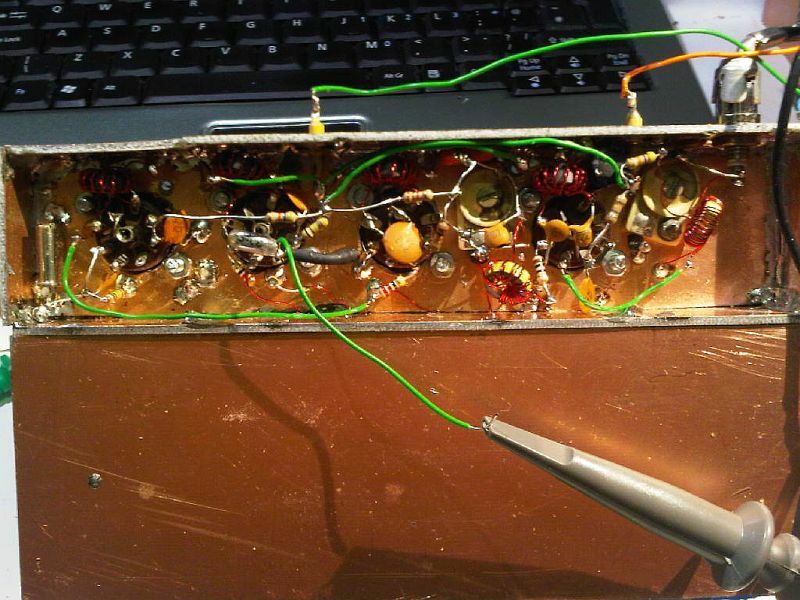 In this test the 0B2 is used for double regulation and 105V supply to the oscillator. The result is the upper blue line in the chart below. Unfortunately the drift is not as good as the DF96 on its own. Possibly this is because the EF91 itself is hot and may have continued to heat the VFO compartment for longer. To make matters worse, when I tried to repeat the experiment a few hours later, the drift was much different (and much worse). The only difference was that I had moved the 0B2 slightly further away from the EF91, but that meant it was closer to the DF96. Since the whole arrangement was just lying loose on the bench, it seems very sensitive to exactly where the wires are placed etc. Basically it's impossible to repeat anything with a set-up like that, so I have to build a NEW version, this time intending to put a buffer alongside the DF96 VFO and the whole thing packaged up in an RF-tight PCB-made box, as oscillators should be.